Some weeks ago I went to see Songs of Redemption (Hereafter SOR) with a couple of friends, one of them an anthropologist who has written extensively about Jamaica and recently made her first film, the other an activist, both Jamaican. The film, set in Kingston’s legendary General Penitentiary (GP), is about an innovative rehabilitation programme that uses music as a tool, helping a set of inmates serving time for everything from petty theft to murder most foul, to discover and hone their musical talent. The film is a stunning production by Fernando Guereta, whose earlier film Why Do Jamaicans Runs so Fast, many of us have seen and appreciated. SOR takes us right into GP, an institution that has been a reference point in many a classic Jamaican song and into the lives of a group of prisoners who absolutely transfix you with their dramatic stories and songs, their humanity, their selves. The scenes of imprisoned men milling around the compound of GP in rag tag bunches is, to me, unforgettable. “Songs Of Redemption” is a documentary that captures the story of redemption and rehabilitation of Jamaican inmates of the General Penetentiary in Kingston. It features riveting interviews and powerful original Reggae music created, performed and produced by inmates wardens and Local Producers. the extraordinary work of human rights activist, Carla Gullotta. After viewing SOR the three of us discussed the film over dinner. While I thought it documented an important initiative that definitely needs wider support and awareness i felt uncomfortable about the fact that all the principals behind actualizing the film and the project appeared to be Europeans and that in an unfortunate way the film therefore reproduced the stereotype or trope of the white saviour rescuing abject black subjects and promising salvation. The latter are revealed to Jamaican society and the world as helpless, incarcerated subjects worthy of being heard and ‘redeemed’. The one black subject with some authority in the film is a Superintendent Fairweather, on the verge of retirement, who by his own account, had always been a champion of prisoner rehabilitation. The impression the film leaves you with is that Carla Gullotta, a Jamaicanized Italian activist, spearheaded this innovative programme under the approving eye of Supe Fairweather sometime in 2007. Imagine my surprise therefore to find out that a rehabilitation programme had actually been in place in the prison system since the late 90s when Desmond Green, founder of the Reverence for Life Foundation, started a branch at South Camp Road (formerly the Gun Court, now The Peace Centre). Louise Frazer-Bennett, who used to manage Ninjaman and Bounty Killer was part of that project and literally pioneered the introduction of music-related programming here. In 2000 Kevin Wallen, a former street kid who had later gone to school in Canada and become a motivational speaker, returned to Jamaica with his brothers hoping to contribute towards the nation in a meaningful way. They started and ran a computer boutique, One Stop Computers, at the New Kingston Mall. While in Canada Kevin had become close to Rubin ‘Hurricane’ Carter, a prominent boxer who had been controversially imprisoned in the United States for 20 years before being freed, an experience that had turned him into a campaigner for prisoners’ rights and rehabilitation. Bob Dylan famously wrote and sang the song ‘Hurricane’ in his honour. Seeing the inmates’ passion and listening to them talk with Ruben, I volunteered to work with them at the South Camp Prison. I was looking for something more meaningful than computer sales, and I wanted to understand why my life had turned out good and they were suffering. Maybe by sharing my journey with them that would make a difference (source: Kevin Wallen’s forthcoming autobiography co-authored with Fern Nesson). Influenced by Carter, Wallen started getting involved with prisoners in the correctional system here, first giving motivational talks, then building a library, introducing computers into the prison and gradually working with a group of inmates who had formed a self-help unit called SET (Students Expressing Truth). SET, which was highly organized and completely inmate-driven had started holding quiz competitions, spelling bees and other activities in prison. Along with Charlie Nesson, a Harvard Law School professor who had also been working in the Jamaican prison system Wallen turned the computer lab into a transformational project. Nesson is the founder of the Berkman Center for Internet and Society, one of the earliest outfits “to demonstrate the transformative potential of the cyber environment“. 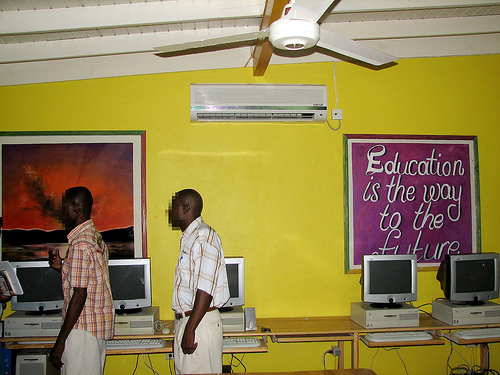 The self-styled ‘Dean of Cyberspace’ set up a programme using Harvard personnel and resources to introduce Jamaican inmates to cyberspace.Provided with the latest technologies inmates learnt video editing, Photoshop, graphic design, built 3-d houses, wrote syllabuses and taught each other to use the programmes. Most of this work was done at the South Camp Road prison facility. After his success at South Camp Wallen built a computer lab at Fort Augusta, the women’s prison, which was also hugely successful and by 2006 tried to introduce the programme to the GP by starting a small project there but to his surprise met with resistance, including from Superintendent Fairweather, presented in Songs of Redemption as a champion of prison rehab programmes. “It seemed like the powers that be liked things the way they were.” Wallen said. Doggedly sensitising the authorities to the benefits of rehabilitation and restorative justice Wallen built a computer lab that could hold 30 inmates at a time at GP. Nesson and Wallen then started thinking about the possibility of starting a radio station at the prison, researching it on the internet and finally with permission from the Commissioner of Corrections and funding from UNESCO which provided the equipment and training, CEDA providing funds for building the space, the radio station was established. The motivation for starting the station was a particular inmate named Serano (who plays a leading role in Songs of Redemption) whose voice and singing had made an impression as early as 1999 when he sang with the Reverence for Life project. When thinking of Kingston, Jamaica, blogging and podcasting are far from the first words to come to mind. “Murder capital of the world”, sure. Bob Marley and reggae music, of course. But a cutting edge prison rehabilitation program, which teaches prisoners at a maximum security correctional institute how to blog, podcast, and even participate in Second Life? Kevin Wallen, the current director of S.E.T. first became involved in the organization after reading an inspirational book by Rubin “Hurricane” Carter, a former American middleweight boxer who was released from prison and pronounced not guilty after spending nearly 20 years behind bars. Wallen, then living in Canada, returned to his native Jamaica and took over the leadership of S.E.T. in June of 2000. Since Wallen’s involvement in the program, over 100 prisoners have passed through the S.E.T. program and not a single one has returned to prison. That is a stark contrast to Jamaica’s traditionally high rates of recidivism (50% in 1993). Wallen has also done an impressive job of attracting international involvement to spread awareness about S.E.T. and motivate inmates. During the January 17, 2006 inauguration of a computer laboratory at Tower Street Adult Correctional Centre, Dr. Rubin ‘Hurricane’ Carter urged inmates to take advantage of the opportunity and learn computer skills to improve themselves. Wallen has also attracted the support of Harvard law professor Charles Nesson, who established the Jamaica Project at the Berkman Center for Internet & Society in 1998. Thanks to Wallen’s influence, the Jamaica Project has recently focused heavily on rehabilitation and restorative justice in Jamaica. You can view a video of Wallen and Professor Nesson speaking about restorative justice in Jamaica on the Berkman website. Nesson remains heavily involved in the project. Two weeks ago he was in Jamaica, where he introduced the male prisoners of Tower Street Correctional Facility to Second Life and met with the female prisoners at Fort Augusta. Over the years, it became harder and harder to work in the prisons. The Administration gave me such a hard time. They preferred programs that made big splashes rather than SET. They didn’t care that a SET member had reconciled with the person that he had harmed or that he had called his mother just to say thank you. I saw a lot of changes in these men but the institution was so caught up in punishment that they were not ready to appreciate SET. Charlie Nesson corroborates the sequence of events retailed by Wallen. He recalls how Superintendent Fairweather would refuse to send inmates to the computer lab when it was first constructed and had to be persuaded of the importance of rehabilitation for prisoners. Asked in a Gleaner interview to name five things that could reform Jamaica’s prison system Nesson replied, “Number One would be to change the real mission of the correctional services from warehousing to rehabilitating prisoners, which means helping them to rehabilitate themselves.” That was in 2010. Yet by January 2013 SOR was portraying the person in charge of GP as a veritable champion of restorative justice–as always having had the philosophy that prisoners needed active programming to help them rehabilitate themselves. What a farce. I emailed Fernando Guereta to ask if I could talk to him about the film but received no reply. Am still willing to carry his side of the story if he makes contact. Re. film, I think I felt uneasy about the lack of context, and the framing of redemption (rather than rehabilitation), and what that meant. Also, wasn’t thrilled about the implicit thing of the white woman “savior” introducing the program and no follow up on what was going to happen now that the superintendent was leaving — will it continue? Who will run it? Who was she and why do we not see her except in the beginning, etc.? Another friend, Garnette Cadogan, who is here writing a story on the Patois Bible for the Paris Review had similar questions. Where was the context? Why wasn’t the programme historicized properly? Why was the whole story so vague? You didn’t have a sense of a point of view; you didn’t have a sense who was doing the programmes; there were all these invisible people–who was teaching the music programmes? how many prisoners were involved? how much time did they spend? Its ostensibly about the reform of prisoners through music programmes but we got no information really about the music programme, we got no information about who was teaching them,or recruiting them, we got no sense of the history, how did it fit in with the other programmes that were there? it was too acontextual. You find yourself wondering is this the programme Jah Cure, the famous Reggae singer who recorded his megahits while in prison emerged from? was it an offshoot of it? I had wondered too why there was no mention of Jah Cure, it seemed an obvious reference. According to Wallen Cure’s trajectory is different because producer Bogdanovich and others were involved in his musical rebirth but that’s another story. According to the film’s direcor, Nando Guereta (see comments), the EU did not fund this film as i had said earlier so I withdraw that statement. He also points out that he was commissioned to make a film about Ms. Gulotta’s work therefore he didn’t see the need to focus on Wallen. I think he misses the point that Wallen ought to have been at least mentioned when setting the context for Gulotta’s work here. But of course as more than one person has complained the film is acontextual which is such a pity and not characteristic of Nando’s earlier films. This post is merely an attempt to historicize SOR, to provide some of the fascinating background to a restorative justice initiative that needs to be known more widely, both here in Jamaica and the rest of the world. Great context…I haven’t even seen the film and I’ve been asking all the questions Garnette asks! But…but…if you haven’t seen the film how could you have asked the same questions? you mean after watching the tralier? This is despicable. I volunteered with SET in 2007 (with Christina Xu). The history with Desmond Green, and Kevin’s incredible leadership was evident. This Carla person was not. Also, inmates’ self-organizing activities were truly impressive. thanks for your comments! glad to hear from people who were actually involved with SET. The basic description of the film made me ask all of those questions. I then went looking after info about the film since I knew about Kevin Wallen and Charlie Nesson’s involvement through Wayne Marshall, Larisa Mann and Christina Xu. I found no indication of such. I also wanted to know if the film would mention Jah Cure…I wanted to go and see a film that told the story of your blog post–that talked about the music program, who was involved, how it was developed, etc. After looking into it, I realized that either I was seriously confused or this was the wrong film to go and see. Annie, I didnt reply to you because my email changed, now it is bernabeu100@hotmail.com. I was aproached by Mrs Gulotta to do this movie, For the 1 year I spent working on this proyect I did not see Kevin Wallen or talk to him, is not that Im trying to disrespect his work, but the subject of my movie was Mrs Gulotta work, not Mr Wallens. As an independent producer I have a right to focus on whatever things inspire me not what someone thinks I shoud do. If anybody else want to do a movie about Mr Wallen wonderful work nobody is stopping them. With all due respect, I dont understand the critiscism, but i do respect your point of view. All the best. Oh, I forgot to tell you one thing Annie, The film is not funded by the EU, is funded by Nice Time which is a Jamaican based company. I find some of your remarks a little bit racist about my origing and Carlas, but so it go. Bless. Hi Nando, thanks for your comments. yes, i’m really sorry you didn’t respond to my email, would have liked to talk to you before posting this. Of course you’re free to make the kind of film you want, just as people are free to point out its shortcomings…the film you made lacks context…as you point out your focus was Carla Gullotta so that’s not surprising is it? Hi Annie, of course if I had got an email from you I would have replyed. I quote you ” i felt uncomfortable about the fact that all the principals behind actualizing the film and the project appeared to be Europeans and that in an unfortunate way the film therefore reproduced the stereotype or trope of the white saviour rescuing abject black subjects and promising salvation.” Annie why someone like Carla who volunteers to work for people in extremly difficult situations must make you feel uncomfortable just because she happen to come with Europe? Im sorry, I just dont get it. I wish I could, but for me this is just a person helpinig other people regardless if they are black, or chinese. Anyways, I respect your opinion and if thats how you feel about it all I can say Im sorry, if anything I said is rude I apolagize. Nando, i didn’t find anything you said rude. i believe it was someone else who said that…I value this exchange that we’re having. i think you’re deliberately misreading me though, the point is not merely that Carla is a white European, why would that be a problem in itself? the story could have been told in a way that would not be reproducing the stereotype i mentioned. But it reinforced the stereotype instead of strategically dealing with it, that is the problem. remember that an anthropologist whose opinion I asked said the exact same thing…this is not a view unique to me. For instance had you made Why do Jamaicans Run so Fast more about you and less about the real stars whom you focused on, i would have said the same thing. But you didn’t, and you know because i’ve told you this in person, that I think its briliant. Had i been racist i would not have said or thought this as you happen to be a white European too. Thanks for your comment Rosamond, it adds valuable detail to the story of Kevin’s efforts, which regrettably have not received the kind of attention it should have. Glad to read your review and comments Annie. My son Makonnen was working with Professor Nesson helping him at the start of this prison technology programme and was with him when Kevin Wallen came on board with his great help as a male mentor and tech innovator. Knowing how much they both were and are responsible for this great programme, I was surprised that neither the trailer nor the publicity about this film mentioned them. I have read this blog with great interest, not least of all Nando’s rather rude comments. By the way, you are quite in order to mention how strange it can be when non-Jamaicans (whether white or not) take an often uninformed look at our culture. Thank you so much for this Annie. I am well aware of the work that Kevin and Charlie and many others have done in SET. I admired the work greatly and was inspired to support them with advice and funding. In October 2005, my then consulting firm Growth Facilitators hosted a 1-day Executive Cyberstrategy conference at the Jamaica Pegasus Hotel. We had 3 professors from Harvard, and Ethan Zuckerberg, one of the pioneers of blogging (he actually set up my first blog for me right there at the conference). We donated US$7,100.00 of the proceeds to SET which they used to equip the computer lab at GP. Context context context – “Those who do not learn from history are condemned to repeat it”. wow! thanks for this Marguerite! had no idea about THAT history of blogging here, and Zuckerberg setting up yours etc. amazing. was all this ever reported in the media here? Yes it was Annie. Can’t find the links now – guess there are in the Gleaner and Observer archives …. It was a great conference – really opened up the discussion about Cyberstrategy and helped executives of Jamaican firms to understand how important it is to overall organizational strategy. Plus, raised some money for a very worthy cause! Nando, btw that IS the email address i used–bernabeu100@hotmail.com. The email didn’t bounce back so it’s definitely in your acct…it was sent on Mon, March 25 at 3.01 pm. Annie, I glad you dont take any of my comments as rude ones because that was never my intention, and againg Im very sorryof you or anybody else thought I was been rude, I do respect you as well as other people who have any other critic. My point is, I start this documentary in 2010, I dont have a record of the activities and different rehab programs, the only one that was inplmented during the time I spent in GP in the ones Miss Gulotta is working with, This is not against SET or Kevin. This is what was happening last year. I want also to say that the world premier of the documentary was help inside the prison, it was attended by 400 inmates and the positive respond was overwhelming. The inmates loved the way I show them, and thats the most important thing for me. More than Harvard. I must also say that the inamates do respecr Miss Goltta a lot because witness it. The response of the various schools who have watched the movie has been extraordinaty too, and also from a lot of members of the music fraternity, especially Freddi Macgregor who joined us at black history moth celebrations, permormed for the inmates and told me that was the most beautiful black history month celebration he heas ever been. Not only him but other various artists like Busy Signal, Protojé I-Wayne, Jugdment Yard, Assasin, Chino and more than are joining, institutios all over Jamaica and the worl, we have been awarded as the best movie in the panafrican film festival a cosntest with thousands of candidates. Now Im going to fort augusta to try to help then female inmates? What are we doing wrong? We are not europeans trying to redeem the black opressors, just people helping people. Best rergards and sorry for not replying ur mail, It was totally unintentional, I will try to find still. All the best and nuff respect. I wrote ina hurry, sorry for the various gramatical mistakes. Again nobody says you or Carla are doing anything wrong. The problem is with the representation of what you/she are doing…we must get this absolutely straight. The activist work in the prison is laudable beyond any doubt, but the activism is a continuum that extends beyond Ms. Gulotta’s participation in it. Thanks for providing all this background, it allows people to get a much fuller picture and that ultimately is what’s important and why i’d emailed you a full 10 days before writing this post…better late than never so thanks once again Nando. and major respect to you too. Wonderful blog post by Annie Paul about a film that focusses on restorative justice. YOU has worked with one of the subjects of the film, Kevin Wallen, and I have met him. He is an inspiration and someone plugging away, against the odds, at trying to improve Jamaica. This post is worth a read and I hope to see the movie at some point. Louis Davis correction: desmond green (DG) had his thing going at gun court since the 80s (small chance it could be the earlier). i know, i met him and spoke with him. he used to live on lower mtn view ave.
DG formed the group gun court cultural theatre and they were immensely successful in jamaica festival drama competitions winning several golds. they generally portrayed cultural and historical stories of garvey, bogle, and i think sam sharpe. ask the jcdc. when i was with jis, i believe we recorded several of the dramas. doubt these recordings still exist. the dramas were magnificent especially looking at where they originated from. the main writer probably still lives in ft lauderdale. he was given day release from gun court to attend then CAST from which he graduated. he was a 1st class dramatist and his use of symbolism was pure genius. the lead in all the stories was a gentle giant named brown. my memory is blank on the1st name at the moment. he was a former nys worker and was one time cultural chairman of the youth service activist group headed by marguerite newlands brother, arthur (‘sluggo’). he was in gun court for smuggling guns during the 1980 election. his story is a tear jerker and shows how life can turn bad because of something outside of your control. while attending a nys group meeting in pt antonio, he was falsely arrested for being in a brawl in a club called stage door. the problem is that he arrived in the town after the brawl, but just before the police arrived. the police arrested 2 of the group wrongfully. the first one was defended by hugh small’s brother but found guilty, based on a tissue of lies. brown decided not to face trial and there was a bench warrant out on him. thats where his downward spiral started. he was a good guy but was manipulated. i can only hope he is alive and doing well. he deserves it. while in gun court, he and others founded the theatre group under desmond green. green is a real hero in the true meaning of the word. he took an immense risk. he went to bat for the group and managed to convince the authorities about the justness of his cause, rehabilitation. for the plays, the group was usually let out w/just DG and one other warder. in all the years, i believed there was only i escape… and that guy came back after a few hours. believe me when i tell you opportunities were available but DG put his faith in them and they rewarded his trust. they never failed him as far as i know. DG was big on prison rehab. i had a discussion w/him down at kgn mall about his plans. this was just about the time that wallen was coming on board. i remember the record shop because i went in there. there might have been another office down at the mall. the sands of time have covered many tracks and i dont know where DG is at the moment, nor Brown. they are the key. i know where the writer/director is/was, but cannot divulge his name w/o permission. but the jcdc should have all the records and names from the time. want the true story, find desmond green. he deserves his time on the podium. the group was one of the most beautiful things i have ever come across in jamaica… and the key to where jamaica should be putting its resources. btw, the jcdc can also tell you about another group that came from west kingston and was very successful in jcdc drama. a very important player in that group was ex jis tv’s beckford (becky, forgive my memory lapse). it will all come back once i post. find desmond green if ‘history’ is to be accurate. i wouldnt be surprised if patsy newland, totlyn oliver or rosamond brown didnt do interviews with the GCCT or DG. they were with jis radio back then. i have to revise annie. the green i’m talking about is paul green. i knew desmond green (who i think now resides in the usa) from later on. the guy who formed gun court cultural theatre was paul green and he was the one associated with the music store downtown. all my references to desmond green should really be paul green. but this shouldnt be difficult to back check with the jcdc. hopefully, that moves things along a little better. this is how truth gets screwed… on the failing memories. thanks, yes v important to get these names and facts correct…yes, my research indicated DG started work in prison systems here in the late 90s. Looks like a very interesting film… It seems a great programme in the GP prison, but i cant help asking… what about teaching them seerious language arts, teaching them to read and write. And encouraging printed Storytelling as well. Writing short stories and perhaps a novel are excellent skills and emotional spaces to have them express themselves??? hyping them up to forever think they’ll become some famous musician is dangerous…. where are we really going as a society…tchhh. why assume that those things aren’t happening Mary? This post is about the music rehab programme not about other programmes which also exist. in fact there is not much in this post about Fort Augusta but Nesson, Wallen and co had the inmates doing blogposts, poetry, storywriting and all the very things you’re talking of. A friend from Trinidad who works for Global Voices said she used to enjoy checking the prisoners blogs at Fort Augusta. None of these things need be at the expense of each other. No Annie, not assuming there aren’t other programmes. I’ve heard of them too… so then, maybe i should have said: “…then we need to HYPE them up too. Make muchhh of them in the same way.” but its all good and REALLY a fantastic program!! The music programme isn’t being ‘hyped’ Mary, it is its huge success that attracts attention. I really don’t see what hyping the literacy programmes is going to gain, the important thing is that it takes place. Also the point is that in Jamaica the innovative use of music in prison rehab programmes has produced wonders. and that’s not surprising considering the vibrant music scene here. We also know that the school system for the wider population is not performing optimally, in fact it leaves many children barely literate, so i don’t see how focusing on literacy programmes in prison would help? Inmates have to be helped to develop their natural aptitudes, not have something forced down their throat because the elites think its important. It is not an easy job and sometimes you see so many horrible situations that you go back home with a stone in the stomach. So help and cooperation are a blessing. i also hope that the movie will help to raise some funds .We are permanently struggling to find some money to carry on the various activities and sometimes I fell desperate because if funds are not enough we cannot do what it is needed and this would be to betray who believes in you and in what you do. it happens twice per year and families are queing for hours just to spend 15 minutes with their relatives It is right? Thanks Carla, for your response. I appreciate it. As i’ve mentioned before my post is not a critique of your work at GP which i think is deeply admirable, thanks for amplifying on this and providing more detail on funding etc. I sincerely hope you are able to secure more funding to keep this very worthwhile programme alive as you have managed to do over the last 6-7 years. There is a convention in storytelling generally which involves locating or contextualizing what is to follow. To me and others it seemed this was lacking in Songs of Redemption. It may have been an oversight or it may have been deliberate, a choice, i don’t know. When i thought this i didn’t even know of the existence of Kevin or the history of rehab programmes and the use of musical therapy broadly speaking. It was in the course of expressing this view that someone directed my attention to Wallen, Nesson, Green and the amazing history to the current programme that you head up at GP now. Because there is no reference at all to this history one is given the impression that the musical programme, the lab, the radio station etc were all established or institutionalized by you when that is not the case (again please correct me if I’m wrong). And this is something that could easily have been avoided just by providing a brief context which would certainly have to include Wallen’s contribution no? So that is the brunt of it. I hope I’ve made my position clearer to you. Of course the inmates are the most important element but in speaking on their behalf let’s not leave out others who also worked with them and for them. Annie, Mr Kelly, who is currently Superintendent at Fort Augusta started the music program well before SET start working at GP. Far from complaining of not being mention in the movie, he loved it so much that he organised a screening at fort augusta which was wonderful and ask me if I could do something in fort augusta as I did GP. Thats shows the difference between ego and true care for the inmates. The more Carla is been harrassed and disrespected the more I love her. good for Mr. Kelly and you Nando! would love to know more. Did Mr. Kelly set up the computer lab, radio station and so on? presumably the music programme goes back even further to Desmond Greene, Louise Frazer-Bennett and others? This isn’t about Kevin Wallen, this is about gaps in the film which caused several of us to raise questions about the context and background of the rehab programme before any of us even knew about Wallen or the others involvement. appreciate the input from all sides….bless. Thanks Nando…regarding Carla…I never imagined otherwise, you keep forgetting that its the way the film depicts her that is under comment not her personally or the wonderful work she and you all are doing. thanks to both you and her for being gracious enough to provide such detailed responses here. It is important for them that their school years are fully recognized. I take with me the most troubled ones once per week and we have a workshop about emotional control and self estime. In dificult cases I have an individual session. A class provided by Heart will teach since May ,computer repair. Inmates have a commettee where they plan programmes and hosts .Inmates send pomes, letters, comments, ,songs to the radio. We have started a choir which is doing well. Seminars are also arranged for the wardens. concerning their professional role. We are setting up a craft lab with the brand Made in Jail, We intend to produce items such as T-shirts in order to self generate some business not to depend on donations only. it is an attempt to promote restorative justice. Since then work keeps going and even if it not always doing in the best way, it is important not to get discouraged . wow, thanks Carla! this is turning into the one-stop information source for prison rehab in Jamaica. That’s an impressive set of programmes, congratulations. Its good to know the extent of opportunities available to inmates, i hope most of them take advantage of the variety of courses. Thanks also for acknowledging Wallen’s role in introducing Stand Up to the relevant people in the correctional services. I’ll certainly take you up on your offer and visit one of these days. I have for the past few days been thinking of the best way to handle whats going on in terms of Songs of Redemption. The truth is I Love the film very much. It Is brilliant. I really like the way it was done. The story lines were fascinating and they for sure caught my attention. I know that those who see this movie will most certainly having been impacted by it. I believe the work that Carla has done with the program is tremendous and I know the inmates are EXTREMELY happy to have her SUPPORT. In the years 2000 – 2006 the SET team operated in South camp and Forth Augusta. between the years 2006 – 2009 we expanded out operations to GP, during this period we worked closely Superintendent Fairweather to tackle some of the challenges, thought the relating was not always smooth, we were still able to accomplish a lot. it was during that time that the SET team was able to enter the prison set up the Computer Lab, Recording studio, and Radio station as well as establish the SET Group at GP. Mr. Fairweather’s roll in the film as someone with power who still believes in the goodness of those in his care. His example will go a far way in inspiring other in his position to follow. I know what the prison was like during the really tough years. and though there were many of us from the outside who came in and help, he was the one who was ultimately responsible for life and safety and over all well being of all persons including both staff and inmates. To have managed the process of changing that culture is no easy task and he did it. I absolutely adore his character in the film and I wish him every success in his retirement. Congratulations, well done. Carla came on board at the right time and for a couple of years before she became a regular to the prisons she gave financial support to the SET efforts as well as host a weekly radio program with one of the Inmates. The fact that she has a human rights background was great as well. With her the program now has the financial support it needs to make it sustainable. Carla’s knowledge of the music business has made a huge difference it the way this project is handled. She has brought a sense of professionalism to the project that makes it real and she insures that all parties are treated fairly which is exactly what the project needed. Thank you Annie Paul for facilitating such an important conversation. Thank you also to all those who participated. I want to also acknowledge Louise Frazer-Bennet and Desmond Green for introducing me to the prisons and to the incredible culture of hope that they had inspired. Major Richard Reese opened the door for technology to enter the prison at a time when it was not easy. His Leadership and Support has contributed tremendously to the culture of hope that is now evident in the prisons. Kevin, I apreciate this post, in a much moderated and reasonable terms. As I have said so many tmes, Songs of Redemption was never ment to underestimate your work or the other people that you mention. I keep in touch with Mr Nesson. Bless. Annie, this has been a fascinating read that I stumbled upon at a most inopportune time but could not leave!! Question….I know the MOJ has a restorative justice programme but this hasn’t been mentioned in the comments or in the post. Does the MOJ’s programme work with/complement/take into account the excellent work that is being done by the folks mentioned here? thanks, no i have no idea about the MOJ programme…will find out when i have the time…sometimes institutional memory is faulty so not sure if they know about the folks mentioned etc.